Finally, the recipe so many folks have been asking for. Coconut milk yogurt with all real food ingredients! The CTF Facebook page has been excitedly waiting for this one while seeing my multiple posts and pictures on the progress of the recipe. This recipe is from the Menu Mailer, Volume 4 Week 29. Please consider supporting our blog by making a purchase of a Menu Mailer subscription or buying some of the issues of the Back to Basics Menu Mailer series. Mailers contain the recipes, shopping list and prep schedule for 6 meals and one dessert every week. 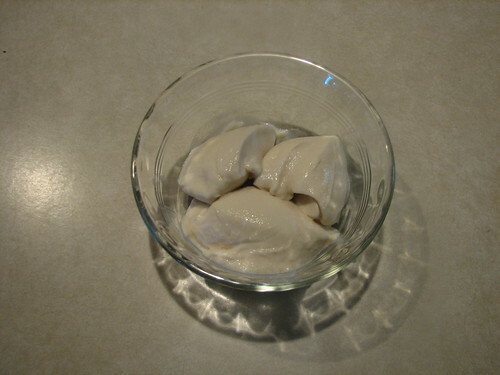 We add extras such as this coconut milk yogurt as we develop the recipes. The Mailer runs as low as $1 a week. You can receive a free Menu Mailer that was published in January, 2011 if you sign up for our mailing list. 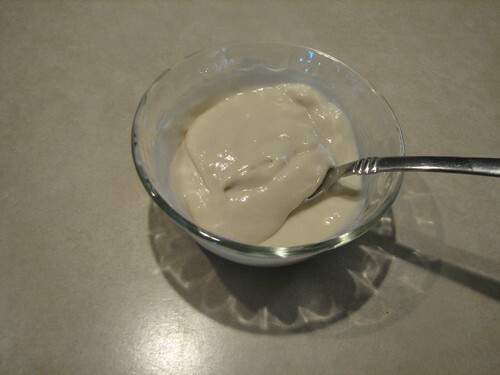 Coconut milk yogurt from the recipe as written, unstirred, incubated 20 hours. The slightly tan color comes from using rapadura as the sweetener to feed the beneficial bacteria. If you need a white yogurt, use honey. Our website was having technical difficulties yesterday. I think everything is fixed and hopefully this will post correctly. I’m thankful for a husband who can handle the tech stuff! Meatloaf is a good meal for when you’re at home but don’t have much time to spend in the kitchen. Mix up a meatloaf, scrub and prick some potatoes and pop it all in the oven at the same time. Mix up a salad and you’ve got a quick meal. This recipe is my go-to meatloaf, and I just add some stevia to the ketchup instead of using rapadura. This meatloaf can be made grain-free by using coconut flour. You can replace the breadcrumbs to rolled oats in most ground beef dishes with coconut flour until the mixture binds together. Coconut flour works especially well in ground turkey dishes, as I find ground turkey to be wetter than ground beef. Pressing out the ground meat before you mix the meatloaf can be helpful when the meat is too wet. HELP! I’ve got company coming to visit and we just had to eliminate gluten/soy/dairy/eggs/25 different foods! I need something quick and simple, because now I’ve got to start cleaning house to be ready for them to arrive! Many conventional meals that Americans recognize are traditional foods and can be served to company without them batting an eye, even if you have many allergies in the family. In this situation, I always recommend you go back to basics. Here’s a list of possible meals to consider. Provide easy and straightforward side dishes like white rice- avoid the bread if you have allergies. Put butter on the table, or mayo if it applies. For dessert, make a blender custard like the one in our Valentine’s Day issue, a pudding, or a quick bread from coconut flour. Depending on your allergies, the nut butter blondies or simple nut butter cookies are great, too. Whatever you decide, make sure it is sweet enough that your guests won’t reject it. Combine all ingredients. Drop by tablespoons on a greased cookie sheet and press down lightly with a fork. Bake at 350 for 10-12 minutes. Makes 1 dozen. This recipe works well with any nut butter. We really like sunflower or peanut butter in these cookies. This post is part of Real Food Wednesdays, Gluten-Free Wednesdays, Made from Scratch Tuesdays and Grain-Free Tuesdays.